I never really saw myself as a “cult leader” type of person. I don’t really think many people do, honestly. 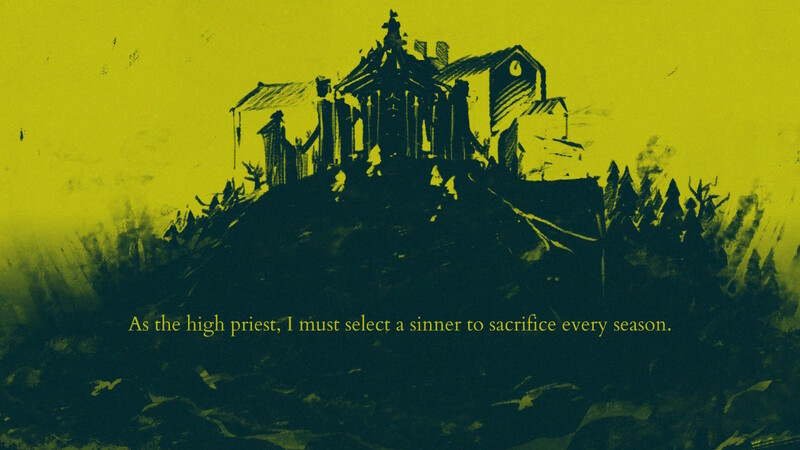 Apparently Kitfox Games thinks they’re an underserved market, however, and so they have brought us The Shrouded Isle for the Nintendo Switch. 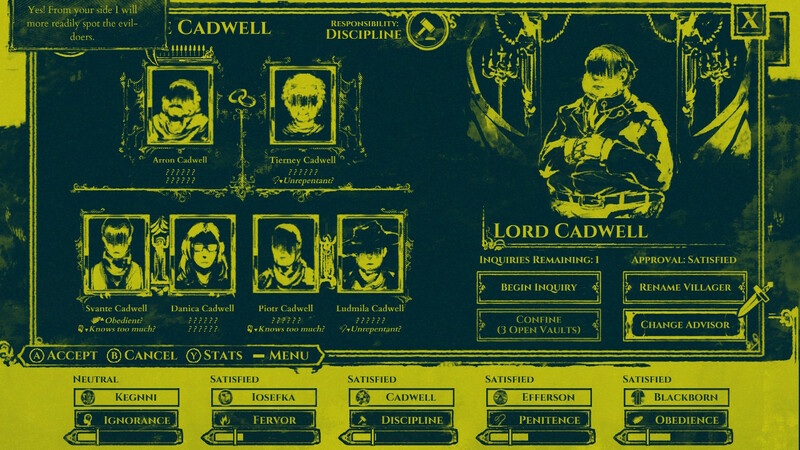 It’s an apocalyptic cult simulator about managing your cultists in accordance with their proclivities. 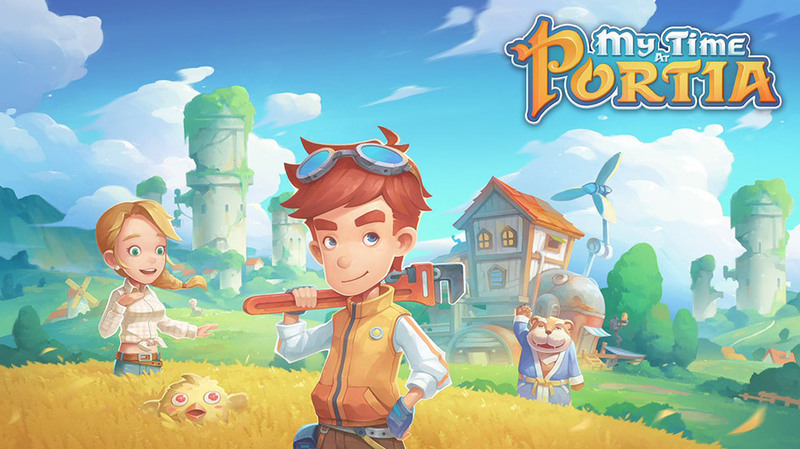 Each game only takes a few hours to complete, and it’s recommended that you play a full game every time you pick it up. The deck is very much stacked against you, but hey – it wouldn’t be a challenge otherwise, would it? You play the role of High Priest of a hidden village founded 495 years ago. The society there worships an ancient god who demands a sacrifice every season. Five families help the High Priest keep order in the village – in addition to their own agendas. 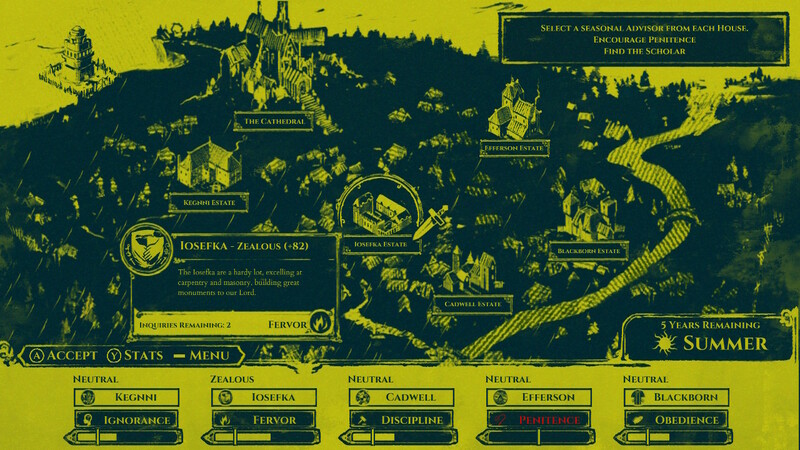 The Keggni ensure the village’s Ignorance, the Iosefka stoke Fervor, The Cadwell maintain Discipline, The Efferson enforce Penitence, and the Blackborn instill Obedience. There are five years remaining until your god rises once again; it is your job to keep all five families complacent and loyal until your lord arrives. Every season you must choose one member of each family to be your advisor for their particular area of expertise. Each family member has one positive and one negative trait that will affect the level of one of the five attitudes of the village – Ignorance, Fervor, Discipline, Penitence, and Obedience – as well as raising the level of their family’s signature attitude. You have to inquire about each family member to discover their traits; but asking too much will make the family suspicious of you and result in a loss of loyalty. Every season lasts three months, and every month you can choose up to three of your advisors to enact policy for that month. Choosing an advisor will raise their family’s opinion of you, while any families not chosen will lose faith in you. Managing the families’ feelings is one part of the game; if their approval gets too low, they will rebel and that’s game over. If any one trait’s meter empties out, that’s game over too. 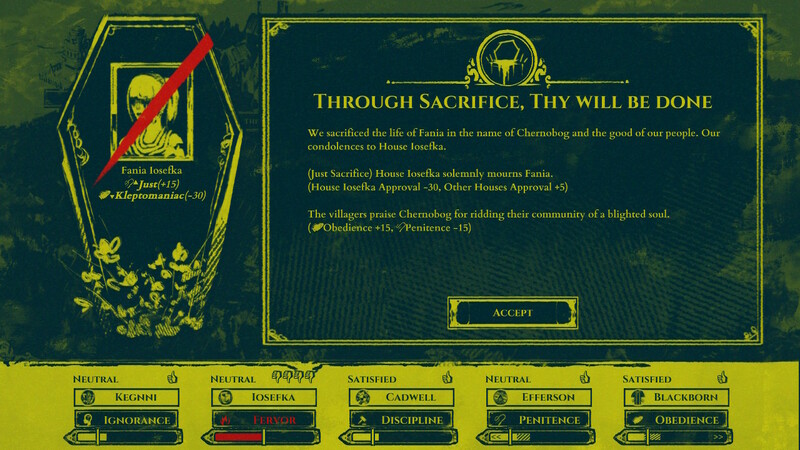 In addition to the regular distribution of work, there are also random events occur throughout the game that will affect either one of the traits or one or more families’ loyalty. Sometimes, for instance, heretical writings will be found, and punishing the writer will anger the family they belong to. Or, you could pardon the writer and gain favor with the family – at the cost of one of some Discipline. Generally the effects of your choices are pretty clear, but sometimes your choices come with an unknown effect. Resource management gets pretty tight pretty quick, so I tended to be conservative with these choices. Finally, at the end of each season, you have to choose one of your advisors to sacrifice to your god. This results in a huge drop in loyalty from their family. You can ameliorate this somewhat by sacrificing advisors with the most sinful negative traits, indicated by that trait being listed in bold. You’ll still lose face with the family, but not as much as you normally would. The other families will slightly approve of any choice that isn’t sacrificing one of their own. Every once in a while, between seasons when you are selecting advisors, a letter will arrive at your office. This is identical in purpose and effect to the random events that happen during a season, the difference being that you don’t actually have to respond to it if you don’t want to. Additionally, sometimes members of the families will come down with a disorder; you can isolate them in your tower to purify their illness. You can also purify healthy people to improve one of their traits. This could also kill them, resulting in a big loss of loyalty. Frankly, once the sicknesses start to spread it’s pretty tough to keep up with purifying everyone so I didn’t get to try this very often, but its benefits seem pretty good to me. Overall the gameplay has enough depth to keep things interesting for a few playthroughs but I found myself losing interest after my first couple of game overs. 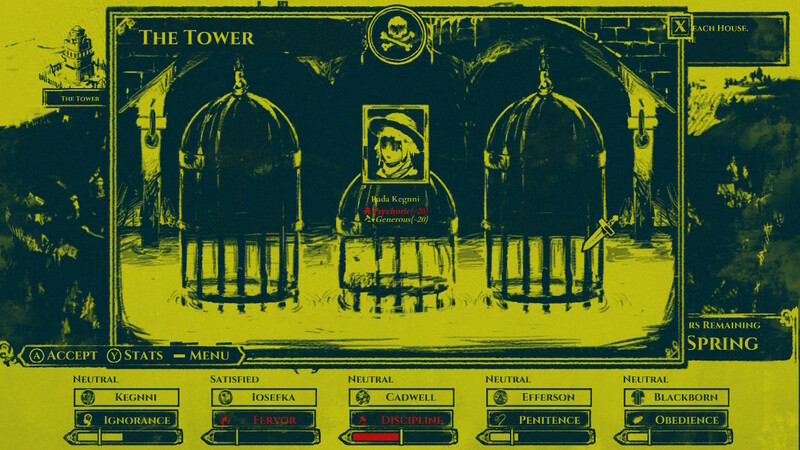 Once you unlock the tower nothing new is thrown in your path and the game can get a little stale. 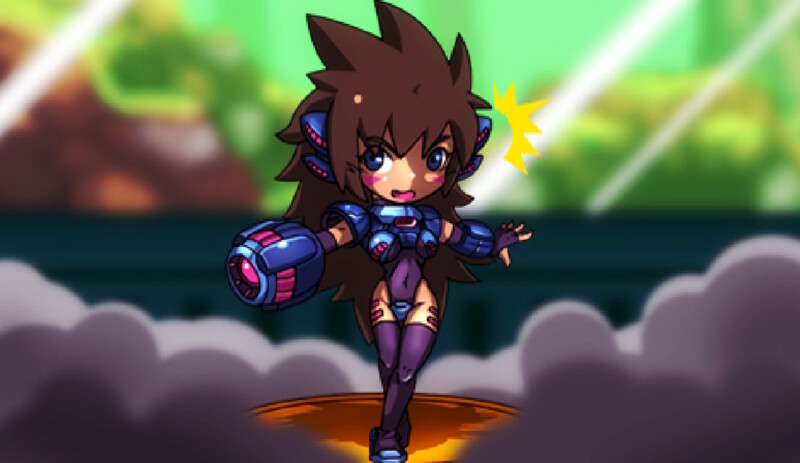 There are reportedly seven different endings to unlock, which is cool, but the story has no characters to invest in and as a result the plot is fairly thin and I found it likewise difficult to invest myself in multiple playthroughs. I enjoyed it more when I waited a few days in between tries; it’s hard to start again from day one when you make it over four years into a game and just can’t get the rest of the way there. 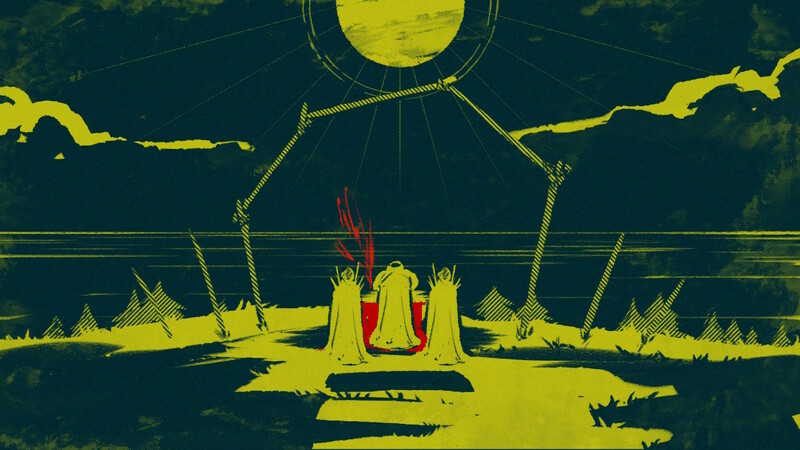 The Shrouded Isle utilizes a very simplistic graphical style. While there are several different color schemes to choose from, they are all two-color palettes. The result is a simple, but attractive, hand-drawn style. There is basically no animation to any of the characters or background screens, so the visuals can be a little dry. Still, like I said, the art style is very attractive, and the overall darkness of all the different color palettes adds to the somber, creepy atmosphere the game goes to great lengths to establish. The music is similarly sparse but spooky. The soundtrack is a lot of slow, somber string pieces highlighting the lonely, sad nature of the village’s existence. 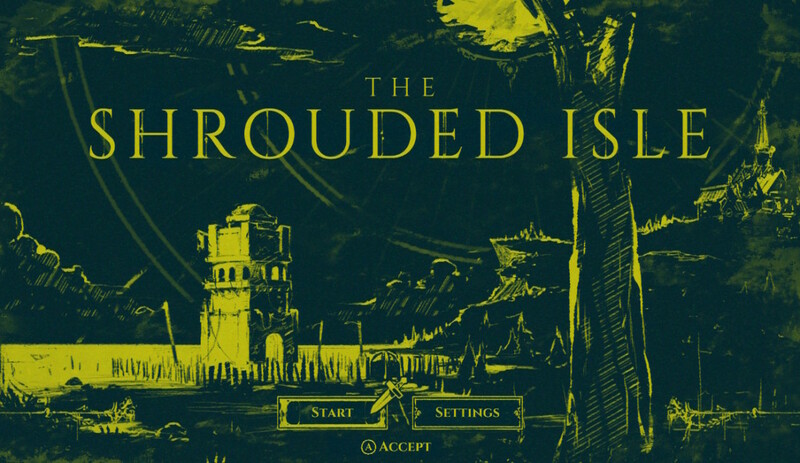 The Shrouded Isle doesn’t use any motion controls, but you can control it via the Switch’s touchscreen if your prefer. 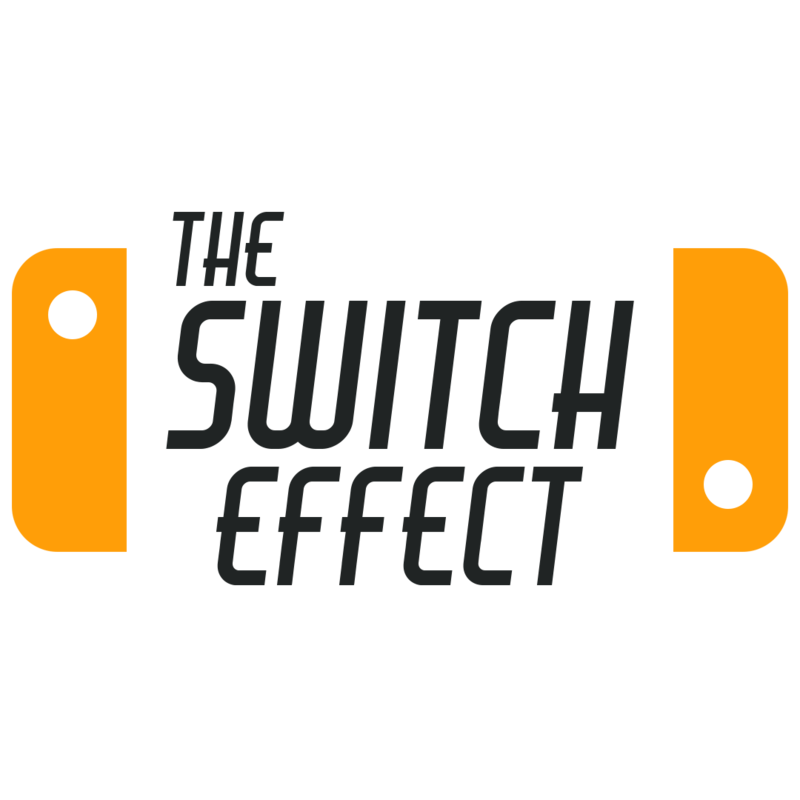 Personally I didn’t have a preference one way or the other in terms of the control scheme, but I very greatly preferred playing the game docked. The game’s text is very, very small and hard to read on the Switch’s undocked screen. It wasn’t a huge impediment to enjoying the game, but it was just more comfortable to read it on the TV. 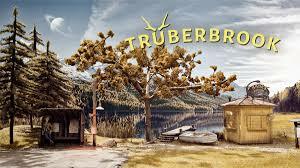 TL;DR: Interesting premise and execution, but it can lose luster after a few playthroughs.